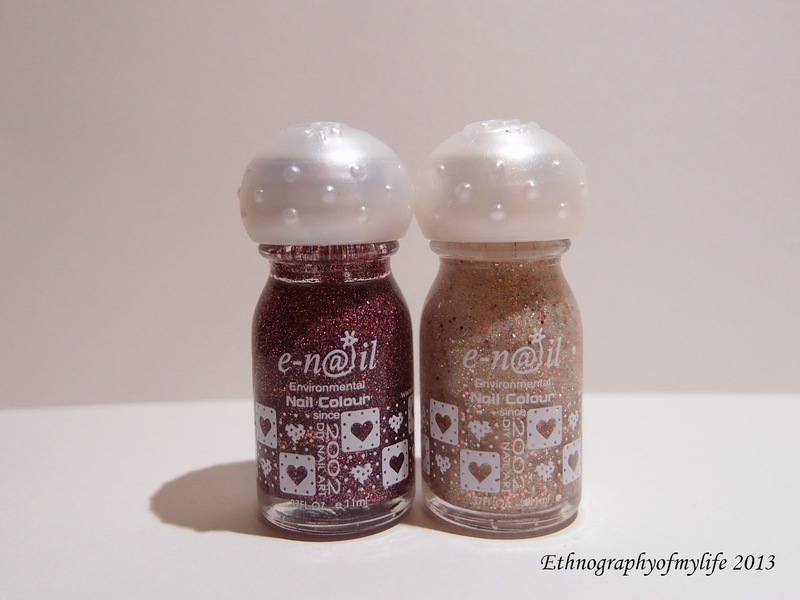 Nobody asks me, but I would love to show you some winter favorites from E-Nail in my collection. If you are a nail-holic, you must know the basic principle to choose polishes. It can be divided roughly into two seasons, Spring/Summer and Fall/Winter. In Spring/Summer, the color of collections are usually lighter, like pale pastels or some soft cremes. In Fall/Winter, due to the lack of sunlight, the dark colors are usually the major choice. During the holiday season, red/green/gold glitters are also very popular. Going to show some of my current seasonal favorites from E-Nail. I probably won't use another polish brand until I go back to North America. There are only two water-based polish brands in here that I can trust. 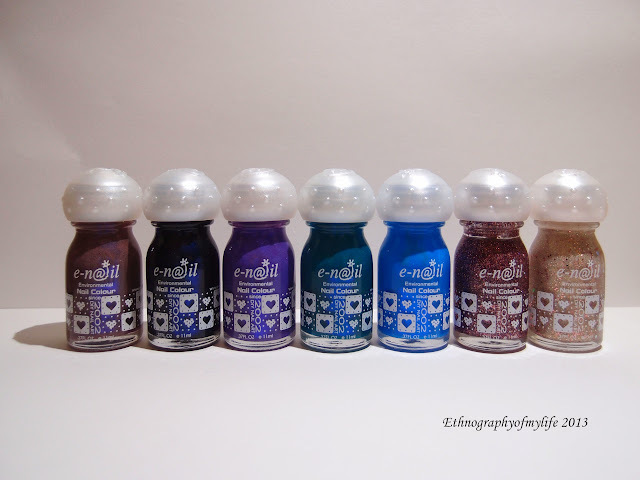 I am going to show you 7 polishes: 5 cremes and 2 glitters for this season. I personally prefer creme type of polishes, because they provide the most rich consistency of the colors. I like that opaque look of the colors, and they are the best friends of nail arts. These five polishes are cremes. From left to right: Mocha, a dark chocolate; Marble, a black everyone should have one in their collection; Dream Lover, my favorite, a dark purple creme; Christmas Tree, dark teal and Popeye, a true blue. It's pretty much the dark cool tone colors. Lastly, two glitters. They can be topped on the cremes above. The Fifth Avenue, a dark purple shimmer glitter and My Wish, a gold shimmer with some round big glitter. 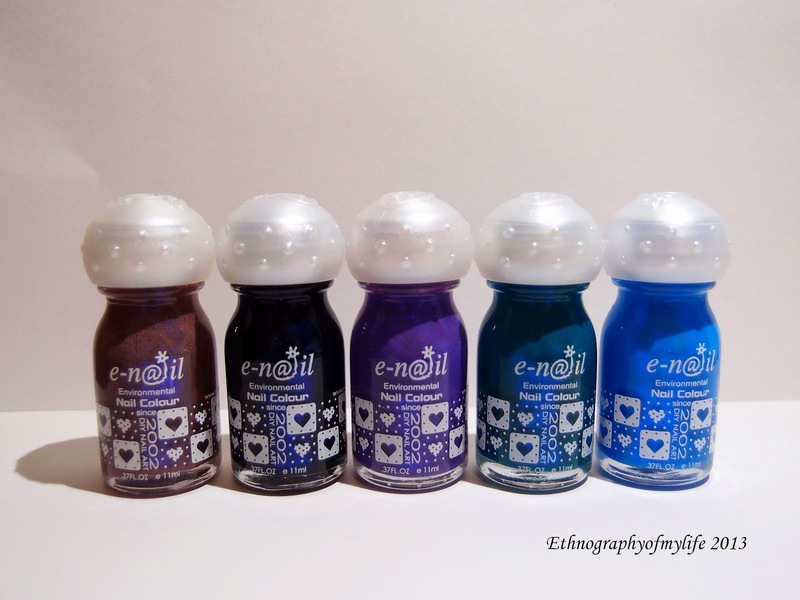 If you don't have E-Nail polishes, that's fine, because it's easy to spot the similar colors in other brands. I suggest everyone to be creative and dare to try some new colors lol One more note: Red is the best friend for all seasons. It's great for holiday season and all year around. Everyone needs a red in their collection!